President Andrews and Dr. Judy Mantle, Dean of the Sanford College of Education, at the Better Together CA Teachers Summit. September is National School Success Month and National University is dedicated to empowering and supporting current and future educators. With the new school year upon us, we were thrilled to be one of the co-hosts of the second-annual Better Together: California Teachers Summit on July 29. 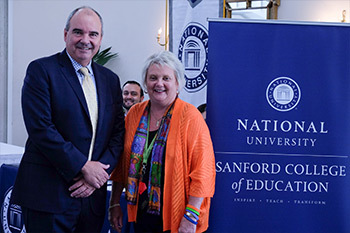 Teachers are a driving force of innovation, and National University is proud to be a champion for educators, which is why we were honored to participate in Better Together and help bring teachers together to celebrate, empower, and support the profession. The Summit was a free statewide day of learning and I was excited to meet so many teachers, teacher candidates, school administrators, and other educators coming together during their summer break to collaborate and share ideas for successful classrooms in the new school year. I was also pleased to see many of our faculty members, students, and alumni participate in the summit to network and learn effective strategies for implementing the new California Standards in their classrooms. One of the presenters, Alicia Johal, earned her master’s in education from National University and is currently an eighth-grade science teacher in Imperial Beach. As Alicia shared her passion for building up STEM/STEAM programs in the local schools and communities, I was proud that such an innovative teacher was one of our alumni. I also enjoyed meeting Tim Calver, who teaches curriculum design and classroom management at National University, and presented the second EdTalk to a room of more than 500 teachers. Tim also teaches literature, journalism, and other subjects in the Poway Unified School District. In addition to our support of educators, National University is dedicated to providing resources to help all of our students succeed. As part of our mission to deliver an exceptional student experience, we have 15 career related events in September and October taking place across California. Our Career Services department is always available as a resource, whether working on a resume, updating a LinkedIn profile, or looking for information about a new career path. At the upcoming 2016 National University Career Fairs, individuals can meet with prospective employers and gain valuable information regarding the job market. Presented by National University Career Services, in partnership with Alumni Relations, this event brings prominent agencies and businesses to network with job candidates from all majors. Folks are encouraged to participate in one of our workshops to prepare for these fairs. The workshops cover topics such as resume review, interview preparation, and salary negotiation. We look forward to seeing you there!